One day, a fire brokes out in the house of a wealthy man who had many children. The wealthy man shouts at his children inside the burning house to flee. But, the children are absorbed in their games and cannot understand his warning, though the house is being consumed by flames. Then, the wealthy man devises a practical way to lure the children from the burning house. Knowing that the children are fond of interesting playthings, he calls out to them, “Listen! Outside the gate are the carts that you have always wanted: carts pulled by goats, carts pulled by deer, and carts pulled by oxen. Why don't you come out and play with them?" The wealthy man knows that these things will be irresistible to his children. The children immediately race out to get into the carts. 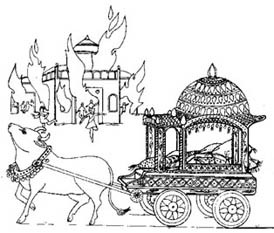 In this way, the wealthy man is able to get his children safely away from the burning house.